An environmental monitoring group has published reports saying that two ships have been pumping their waste oil out to sea, in a process known as bilge dumping, off the coast of Sumatra. The findings are based on a combination of satellite imagery of the slicks, which extend a total of 135 kilometers (84 miles), and tracking data from the ships. Activists say these findings highlight just how common bilge dumping is in Indonesian waters, and the lack of enforcement against the practice. Officials had not commented on the matter as of the time this story was published. JAKARTA — Two ships have been spotted allegedly dumping waste oil in the sea off the eastern coast of Sumatra, highlighting what activists say is poor enforcement against marine pollution violations in Indonesia. One of the vessels has been identified in a report published March 26 by the environmental monitoring group SkyTruth as the Perkasa, a cement carrier operated by Jakarta-based shipping company PT Indobaruna Bulk Transport. SkyTruth’s report showed it was trailing a slick of oil some 18 kilometers (11 miles) long northbound in the Malacca Strait as of Feb. 15. In a separate report, SkyTruth also reported possible bilge dumping on Jan. 8 near the northern tip of Indonesia’s Bangka-Belitung islands, located to the south of the Malacca Strait. 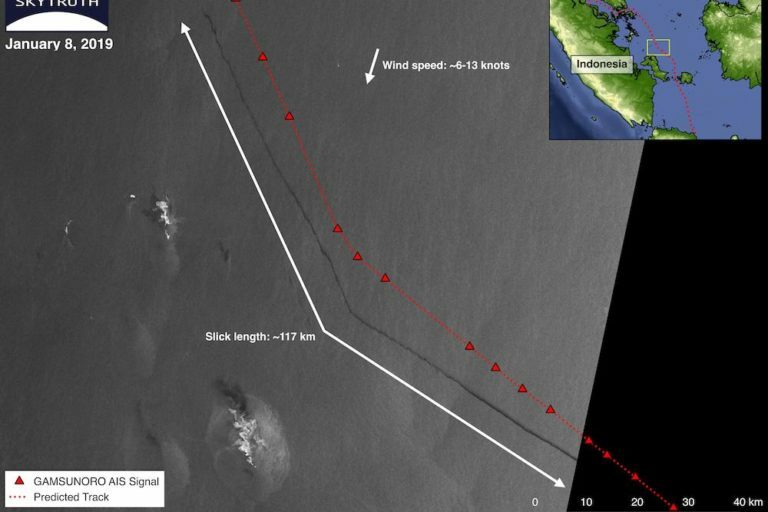 It identified the Indonesian crude oil tanker Gamsunoro as the source of the slick, which stretched at least 117 kilometers (73 miles) when the researchers captured the image. The report didn’t name the operator of the tanker, which at the time was anchored near the town of Indramayu on the northern coast of the island of Java. 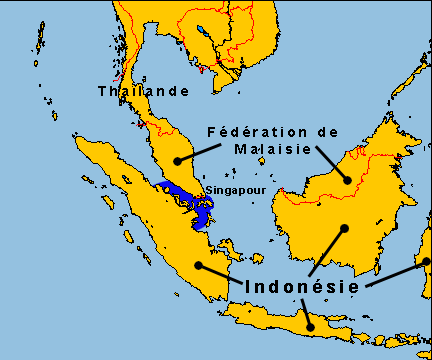 The Malacca Strait, highlighted in blue, is flanked by the island of Sumatra and the Malay Peninsula. Image courtesy of Lozère via Wikimedia Commons (Public domain). “The best we can say is, based on our cumulative decades of experience analyzing thousands of satellite images for oil pollution, there is clearly a slick of oil or an oily substance emanating from a vessel that is visible on the satellite image,” John Amos, the SkyTruth founder, told Mongabay in an email. 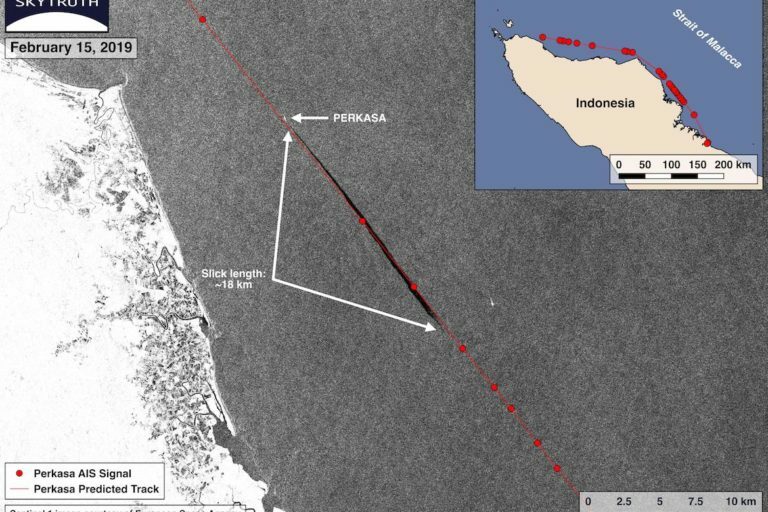 An overlay between satellite imagery showing the slick and vessel broadcast signals from the cement carrier Perkasa. Image courtesy of SkyTruth. 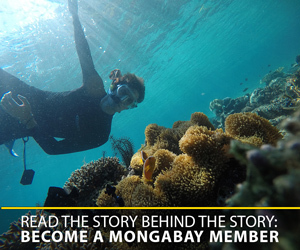 Mongabay contacted both organizations as well the ship’s operator for comment, but only ClassNK replied. It confirmed that the Perkasa was registered with Tokyo-based ClassNK, but declined to answer questions regarding the allegation of bilge dumping. An overlay between satellite imagery showing a slick and AIS broadcast points from the oil tanker Gamsunoro. Image courtesy of SkyTruth. Banner image of oil spill slick on a Singaporean beach courtesy of Ria Tan via Flickr (CC BY-NC-ND 2.0).